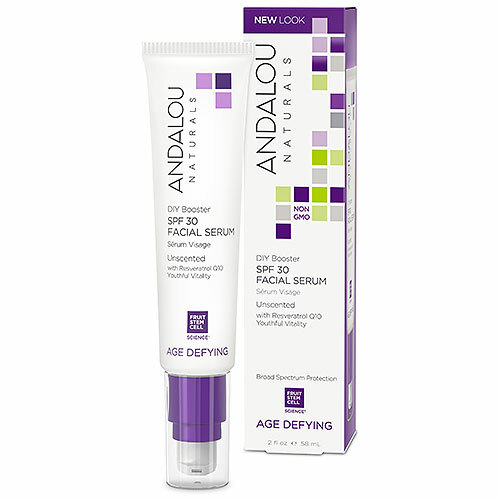 For Dry/Very Dry Skin, Fruit stem cell complex and resveratrol CoQ10, super antioxidants, boost dermal vitality as this easy to use SPF 30 sun protection joins your facial routine for a rejuvenated complexion. Active Ingredients: Octinoxate 7% (Sunscreen), Octisalate 5% (Sunscreen), Avobenzone 3% (Sunscreen), Zinc Oxide 0.1% (Sunscreen. Inactive Ingredients:Aloe Barbadensis Leaf Juice*, Purified Water (Aqua), Vegetable Glycerin, Cetyl Alcohol, Stearyl Alcohol, Sorbitan Oleate Decylglucoside Crosspolymer, Camelina Sativa Seed Oil*, Fruit Stem Cells (Malus Domestica, Solar Vitis) and BioActive 8 Berry Complex*, Resveratrol, Ubiquinone (CoQ10), Zea Mays (Corn) Starch*, Camellia Sinensis (White Tea) Leaf Extract*+, Aspalathus Linearis (Rooibos) Extract*+, Hibiscus Sabdariffa Extract*+, Phenethyl Alcohol, Ethylhexylglycerin, Tocopherol. Use daily, alone or under make-up. Apply liberally 15 minutes before sun exposure and as needed. Reapply every 2 hours or after swimming, towel drying, perspiring heavily, washing, or in the case of products applied to the lips, after eating or drinking. 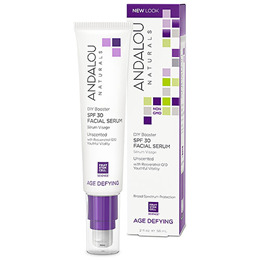 Below are reviews of Andalou DIY Booster SPF 30 Facial Serum Unscented - 58ml by bodykind customers. If you have tried this product we'd love to hear what you think so please leave a review. Feels thick, dries really quickly on skin. Tube+pump mechanism do not feel like a good combination: the tube is still 3/4 full and yet pump does not output anything. Otherwise feels lighter than expected a few minutes after application, seems to be absorbed fast and does not leave skin clogged/shiny/oily like most creams of that thickness do.